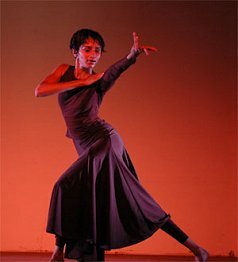 December 26, 2006 Nritarutya's Adhyaya held on 8th December was a self-funded evening of art, conceptualized to promote art unconditionally. Held at the Seva Sadhan, Bangalore, it was a lyrical presentation that turned the spotlight on some young and fresh talent. 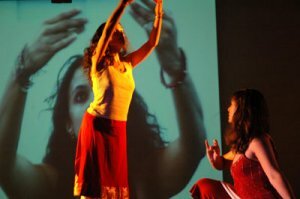 Presenting some new perspectives was the Post Natyam Collective, a group of dancers from USA, who explored contemporary Indian dance and performance, using the idioms of theatre and multimedia. 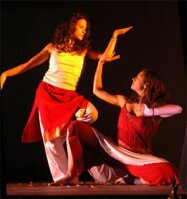 The artistes were in India to perform for The Other Festival in Chennai. Shyamala Moorthy and Sandra Chatterjee, with their diverse influences and training that ranged from ballet to Polynesian dance, performed with fluid grace and gave a new twist to interpreting Bharatanatyam as we know it here. Their combined performance of ‘Meet the Goddess’ was a parody of the many roles played by a woman. The second half of the performance was by Veena Basavarajaiah, who in her lithe form danced with a lyrical quality where movements were perfectly controlled and executed. A combined performance by Veena and Nakula Sommana, using newspapers and video showed the impact of technology and news on the lives of common people. The performance also witnessed an innovative gesture of inviting a panel of eminent persons such as film director and theatre person M S Sathyu, Bharatanatyam gurus Minal Prabhu and Bhanumathi and Bureau chief of Magna Publications Anupama Bijur, to review and appraise the artistes' presentations. "The evening was a refreshing experience and was a credible effort at showcasing alternative vocabularies in dance," remarked Anupama Bijur.